Check out what Paula from Salad in a Jar has to say about the Kleynhuis Pouch! Read her honest review, plus browse all of her other practical recipes and tips. She and her web site are packed with great ideas. The nylon version of the Kleynhuis Greek Yogurt Strainer Pouch is back in stock on Amazon and will be ready to ship by April 30. 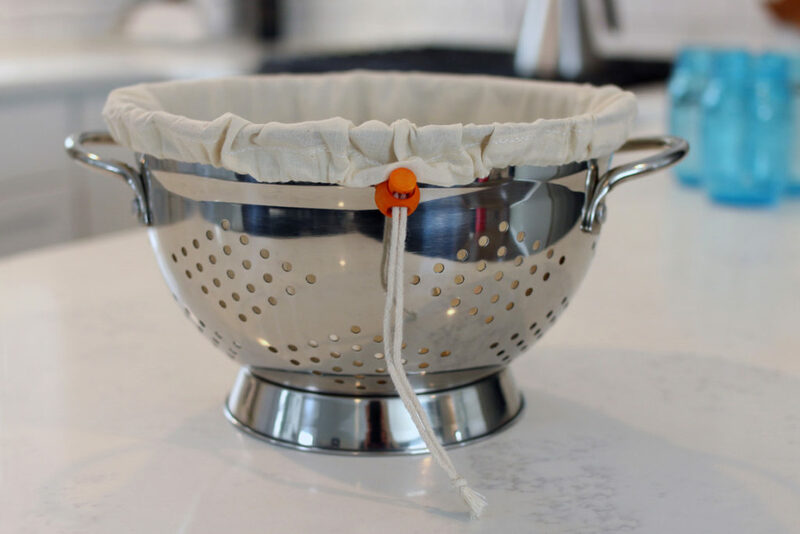 HANDY CORD LOCK stays tight to either close pouch or conform around your bowl / colander rim. For taller bowls, you can fold the pouch over your bowl, cinch the cord lock tight, and your liquid will strain to the bottom of the bowl and you don’t even need a colander! EASY-TO-CLEAN 16”X9” pouch made of 100 micron ultra-fine mesh (the LOWER the micron number the FINER the strain). All the seams are sewn to the outside to ensure it’s as easy to clean as possible. 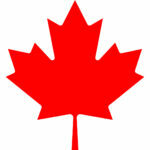 Now also available for shipping in Canada on Amazon.ca. Finally, a reusable alternative to cheesecloth for Greek yogurt lovers! 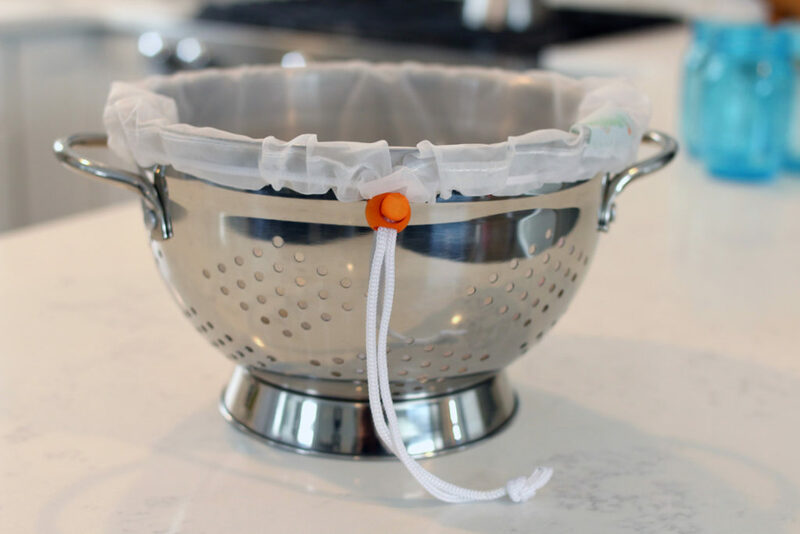 Turn any colander into an ultra-fine strainer. Simply line your colander with this bowl-shaped, reusable strainer pouch and spoon in freshly made yogurt. While the yogurt is straining, collect the nutritious whey in a bowl or pan underneath and use in future healthy food and beverage recipes. Thick and creamy yogurt is just a couple of hours away! For years, I’ve enjoyed the nutritious benefits, creamy taste, and personal satisfaction of making my own yogurt. But, straining yogurt was always such a pain and I knew there must be a better way! So, I experimented with many batches of yogurt and how best to strain it; I designed and sewed the pattern for the original Kleynhuis Pouch prototype; I made more Greek yogurt and tweaked the design; and then I spent a year figuring out how to make this Kleynhuis product available to others. These are the reasons I think the Kleynhuis Pouch is better than any other straining method out there: 1) It’s much easier to clean than cheesecloth; 2) It’s designed to strain at least a gallon at a time; 3) It fits easily in any drawer; 4) It’s not expensive; 5) The design fits most colanders/bowls that you already have in your kitchen. So, no matter what method you use to make yogurt (crock-pot, oven, electric yogurt maker, Instant Pot, etc. ), straining is the final step that will make your yogurt thick and creamy. Avoid any and all suggestions to add thickeners to your yogurt that will only alter the taste and require unnecessary additives! Don’t let the pain of straining yogurt take the joy out of making your own yogurt! Homemade yogurt tastes better, is more nutritious, and costs less. I love Danielle’s breakdown of reasons why you should make you own yogurt on her meal-planning blog, Project Meal Plan. Kleynhuis Pouch Care Instructions: After using, turn the pouch inside out and hand wash with hot tap water and a mild, fragrance-free detergent (no bleach). Rinse, wring dry, and hang for a few minutes from your faucet so the sink catches any drips. Hang by the string to a cabinet door until completely dry. Nylon dries very quickly! Store in the handy zip bag to keep it clean until your next use. For stains, soak in warm water with 20% hydrogen peroxide. Wash before first use.